When I was thirteen my parents decided I should go to France for the month of August and stay with a French family. The father happened to be a top executive at Air France and was a business associate of my father’s, so that is how the host family was chosen. They also had a 16-year-old daughter who loved to ride horses, as did I, so all the adults agreed this was a good match. Their summer home was in the south of France near Lyons. Their daughter had a cousin of her age visiting as well. I have blocked out their names. The social aspects of the trip were a disaster. The disparity between a 13-year-old and a 16-year-old were much greater than any of the adults imagined. (They should have just asked us kids). Throw in the cultural differences and I felt like the odd gal out. We did ride some beautiful horses on the occasional morning (it would get too hot by midday), but the instructor only spoke French and my comprehension was not up to snuff, so frustration abounded. The two bright spots were her stereo and record collection, which included Deep Purple and Cat Stevens, and also her uncle’s modest chateau. Her home was at the base of a small mountain. Up the mountain was her uncle’s place, within walking distance. On a daily basis we would take off in the hot late-summer sun and begin our trek up the mountain. As soon as we got to the edge of the property we would be greeted, if that’s the right term, by her uncle’s scary Bouvier des Flandres. This is a large breed of dog known for its formidable appearance and protective nature. He knew this was his land and he would give us the once over every time, but either he was all bluff and no bluster, or perhaps he grew accustomed to our scent. No matter, he looked scary, but he never followed through on any of his apparent intent. Once at the chateau we would head for the pool. It wasn’t opulent. Just a simple cement rectangle and just clean enough to swim in. I think us kids were the only ones who really used it. I was a very proficient swimmer and adored spending time in the water, to the point of becoming waterlogged with prune-like fingertips. But I had never experienced water like this. The first time I dove in, it took a few minutes, but it became apparent that there was something different about the water. I was used to pools back in the States, where, whether it was in a friend’s yard or at a public facility, there was usually some measure of chlorine that you had to contend with. This was not chlorine I smelled – or tasted. It was sweet and musky and was definitely of food origin. I looked around and realized that the vines that wrapped around the railing along one long edge of the pool were grape vines. 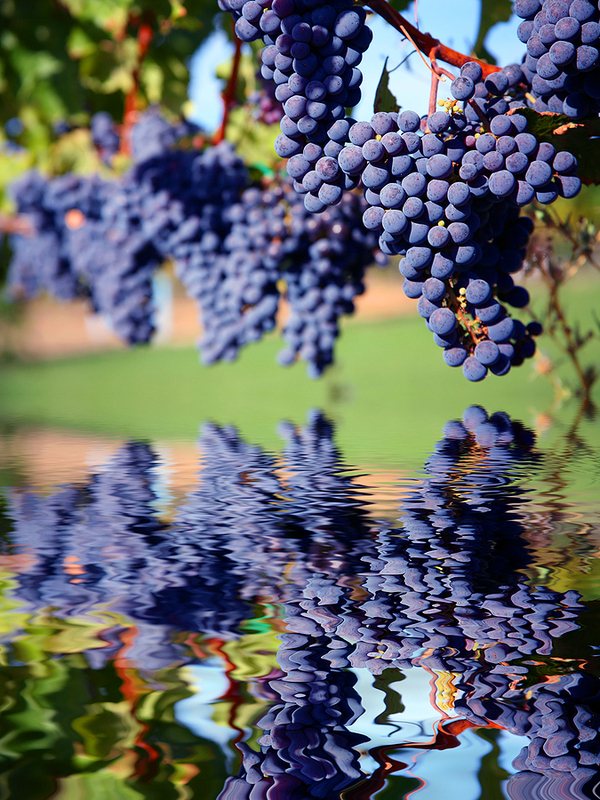 The vines hung over the water and very ripe grapes had dropped into the pool, perfuming it and my experience. I swam over to pluck one from the vine. They were smaller than the grapes I was used to seeing in the supermarket and quite firm. And they had that foggy look to them that some grapes and even blueberries get when they are on-the-vine or just picked. I popped one in my mouth, which puckered up immediately. They were quite sour, but I could immediately smell and taste the flavors that I had noticed before. I was swimming in grape juice! Fancy French grape juice! The grapes that landed in the pool were ripe to the point of being almost fermented, which just reinforced the aromatic wine association. What a romantic notion, especially to a 13-year-old. No one else seemed to find this fascinating or as amazing as I did. I don’t think I even discussed it with anyone. It became one of those private moments you have as a young adult that no one around you is aware of, which suited me just fine. The trip didn’t last. I was supposed to spend the month, but after two weeks I had had it. I was lonely and if I had to listen to Smoke on the Water or Wild World one more time I was going to explode. Arrangements were made for me to go home early. I got through it by taking long walks by myself along the country roads and talking out loud to my bull terrier Lily, who was back in NY. I was convinced she could hear me and I would complain to her about how no one there understood me like she did and that I couldn’t wait to see her. It offered me an immense amount of comfort; these “conversations” held me together just enough until I left. I don’t think I even had a conscious farewell swim in the pool. The rest of the visit was just too miserable and cancelled out the perfumed water. But I still remember the aquatic immersion experience like it was yesterday, while I don’t even remember the people’s names.